In this post, I’m going to share with you a quick tutorial on how to backup your WordPress website using a professional online solution provided by BlogVault. So, what is the best solution for backing up your WordPress website or blog? Well, before we look at answering that question, I want to first share with you some thoughts on why I think backing up your WordPress website is a critical part of building a successful online business. When I began my blogging journey back in October 2010, I didn’t have any type of backup solution. In fact, I went through the first 6 months of building my blogging business without really thinking about it, and I didn’t really appreciate the importance of backing up either. That was up until March of 2011, just 8 months after I started my blog, and guess what happened? My site got injected with some kind of malware for the first time. Of course, being fairly new to all of this at the time, and not having any kind of security or backup for my blog, I made a silly rookie mistake. I logged into my cPanel, thinking I could delete a few files and replace it with new ones. What I actually ended up doing was permanently deleting the database to my WordPress site, losing all of the content and work I had put in… And to top it all off, I had zero back-ups. I should also mention, at the time, I was on a very basic shared hosting plan with Bluehost and they didn’t really have a recent backup that I could revert to. What I did have, though, was a copy of every single blog post in .txt that I simply republished. I think there were around 40 or so articles, some with comments and some with none. All the custom pages I created, however, were gone, so I had to start writing them again, along with customizing my site all over again. I spent an entire month rebuilding my blog from complete scratch. I had already built up some traffic to that blog too so you can imagine the problems I was having, not to mention having to redirect 404 error pages, and so on. Shortly after building my site back up, I immediately went and sought a professional backup service. I made the mistake a learned from it. I don’t want this scenario happening to me again, nor to you for that matter. You work so darn hard to create an epic website for your business, right? So isn’t it about time you took out a little insurance? in the form of using a professional backup service for your site, that is. Did you know that more than 70% of WordPress websites are vulnerable to hacker attacks? So, hopefully, you can appreciate the importance of backing up properly. 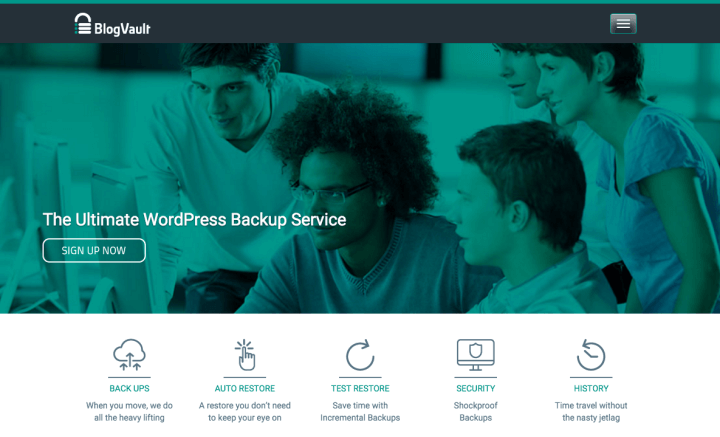 What is the best backup service or solution available today for WordPress sites? Any professional premium backup service is good, and there are some great sites you can use for this. I don’t recommend using a free backup solution at all. Like using one of the many free backup plugins available. I’ve tried most of those myself, and none of them makes me feel easy in all honesty. In addition, backing up on the same server your site is hosted on, isn’t a solution either. Neither is downloading a backup Zip file to save on your computer. What are you supposed to do with a Zip file of your site exactly? Nothing much is the answer to that question. The premium backup service I recommend using to backup your WordPress blog is provided by BlogVault. 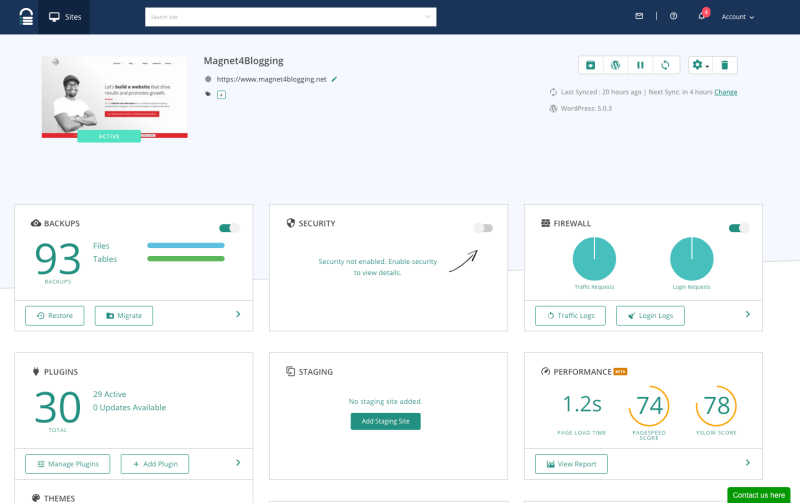 I’ve been using BlogVault since 2012, and I’ve even carried out a full WordPress website migration from one domain to another using this service. Migration is just one of the many tools provided by BlogVault. You can learn more about BlogVault here, however, below I’ve outlined the process for backing up your WordPress site with BlogVault. Your first step to professionally backing up your WordPress website is to signup to BlogVault. BlogVault provides a complete solution. Site migration to another server or domain name. Site security and Malware scanning (Larger plans). Upload backup to Dropbox, and more. The most time-saving feature in BlogVault is having the ability to back up all of the files and restore your site with just a few clicks, should you ever need to. 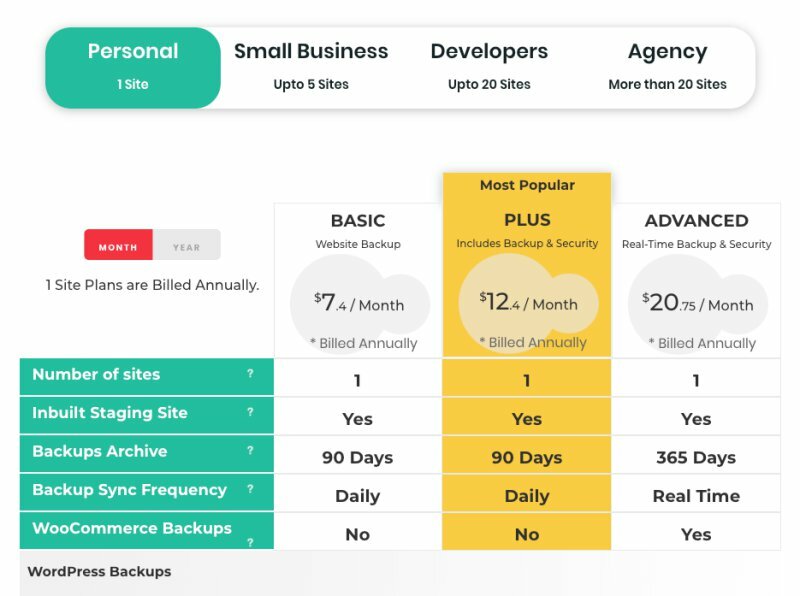 Other similar solutions: There are, of course, many other premium backup service providers available, such as VaultPress (Created by WordPress) and BackupBuddy. Both of these are great too, so do check them out if you feel BlogVault isn’t for you. Below is a screen capture of the current plans available from BlogVault. If you have one WordPress blog or website, the basic plan should be ample enough and is quite affordable at just $9 per month, or $89 per year. Once you’ve selected the plan you require for your backup needs, you’ll need to install the plugin on your WordPress site. There are two ways you can do this. 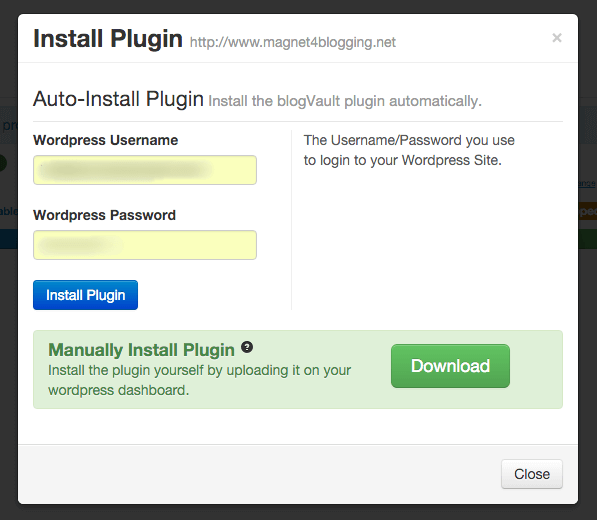 The first way is to install the plugin directly from your BlogVault dashboard. You’ll need to enter your username and password for your WordPress site. I would recommend this option to ensure that the plugin is properly installed and activated on your site. 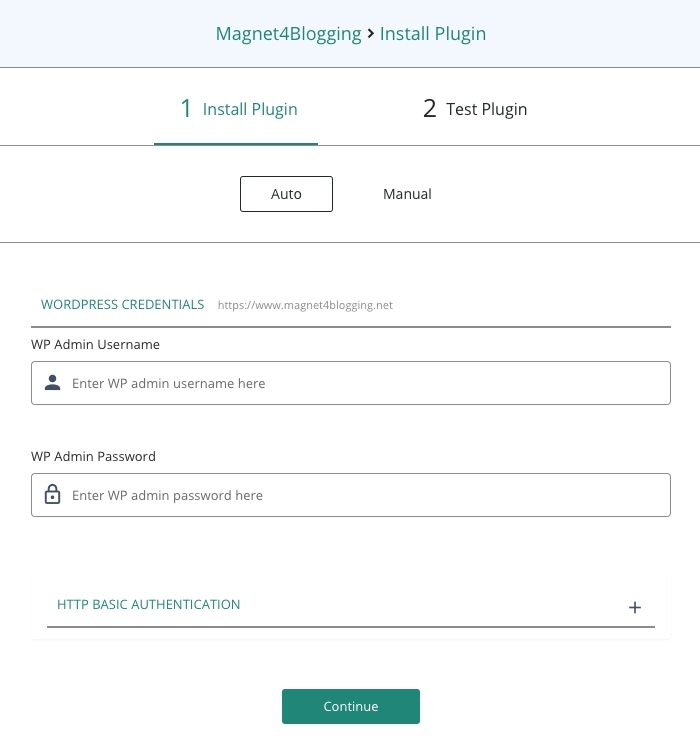 The other way to install the plugin is to download it first, and then manually install it yourself via your WP dashboard. See images below. The last step in this simple setup is to actually back up your site. Each plugin is uniquely created for each website, so it’s just a case of installing the plugin and seeing the backup take place on the dashboard of your BlogVault account. See image below. Backups take place once per day, however, you can change the time in which the auto-backup takes place on your site. I always have mine running around 11pm every day, as I’ve usually completed most of the changes I want to make to my site for the day by then, i.e. updated blog posts, uploaded new images etc. So there you have it folks, a simple, cost-effective way to back up your WordPress website or your blog. Now you should be able to sleep better at night, and not have to worry about logging into your computer the next morning only to find out your site has been ransacked, right? Of course, backing up your WordPress site is just the start of keeping things secure. You should always have other solutions in place to keep your site safe, both from yourself (should you make the mistake like I did), and others. Check out the following two blog posts below. What are you doing to backup your blog? OK, so lastly I want to converse with you. What are you doing to backup your WordPress site today? Are you using BlogVault or another service which you’d like to share with us? Do you even have a solution in place or are you planning to take action immediately to get something sorted out for your site? Why I’ve Started To Use CoSchedule, And What Is The Most Affordable Alternative? I have always backed up my site on the server and then downloaded it to my computer/backup system. However, this sounds like a really good solution. Back in 2012 I had a similar situation where my site somehow got infected with malware and it cost me $200 to get it cleaned and healthy again. That was so frustrating! To this day I am still baffled. I will definitely check into this solution Fabrizio. Hi Don, thanks for stopping by mate. Sounds like you have a plan, I used to backup my site and download a copy to an external hard drive. But that proved to be quite a chore to do on a daily basis. Also I the effort it would take me to get my site backup running again wasn’t worth thinking about. Although I’m a lot more savvy with things these days, I love using a backup service like BlogVault. It takes the worry away at least. I hear you on the malware issue, it’s something that’s still affecting a lot of WordPress users I know, at least we have a lot of options today to keep out site’s safe online. Have a great rest of the week Don.